Sending email function, just modify SMTP host, username and password. Here you can use GMail SMTP details for testing click here to see GMail SMTP article. f-yah ive been waiting for this. thank you so much..canyou please make one for admin area? where admin can de-activate the users account? That's a nice tutorial, thanks for the email. Why use you the google comment system? Otherwise, thanks for the tutorial, but how can I implemet to wordpress? nice tutorial.. I was creating similar tutorial and just saw you published. I liked that url redirection part. u r so great..thanks alote.. Simple And Nice Tutorial. Looking for more. sir is this working on wamp server? If mysql_() functions are deprictaed, is it good to use mysql_real_escape_string() ? Is there another function which is better than mysql_real_escape_string() to escape quoted values? Hi, nice script! But why did you use "mysql_real_escape_string" and there a mysqli function for? Gud one..Love the post by you..
Hi. its a great stuff but there are two things that can be done. also and additional check to see if the user is already registered or have registered but the verification is pending and on the basis of that we can send mail. today i sent mail from local_host using gmail_smtp on window platform . Good Post. I helped me alot. Thanks Srinivas, I was in search of this code. Your tutorials are very useful and very easy to implement. Thanks again for such beautiful code of email verification. I'm a big fan of your blog... keep the tutorials coming! thanks. can anyone tell me what is "class.phpmailer.php" and where can i found it??????? How about keeping activation code in users sessions? this tutorial helps me a lot ..
Also, the code works really well, except data from the form does not seem to be getting to my database and I have no idea why...everything else works okay, email with activation code is sent but I can keep signing up with the same email address and the system won't know. the script is written very well manner, easy to understand. I am getting problems during the execution of this script. 1) When i am clicking on activation link to activate an account, it's showing that URL /activation/74bedce29eab40e1572bda5beb922386 was not found on this server. 2) I am not getting the $_GET['code'], from where the input variable code came, in activation.php file. if its from activation link, please guide me how to get activation link to activation.php files. The requested URL /emailsmtp/includes/f727ac95140514b002f625885f63b258 was not found on this server. I used this code to send email to the clients. The HTML tags is working in Gmail but not in Yahoo and other Mail Servers. where is class.phpmailer.php file ???????? how can i create in html send verification mail for activation of ad that i want to post or submit in my site. that email can working in offline mode or must online mode?thank you. MySQL has not been deprecated. It is being thought if it has to be or not. is it work in localhost??? it will not work on localhost you have to upload your content on server.. and admin nyc tutorial but can you please make tutorial for getting forgot password retrieval with email...? I have no idea how to trigger the form, i'm using an external index.html, even your action="", how do they really trigger?? Your post is really helpful for me. Thanks for your wonderful post. It is really very helpful for us and I have gathered some important information from this blog. mail was not sent only insert into data base please help. That's very useful for me..but i need one help..how to check the email id is already exists or not using php please help me..
where to put the code of activation link and to create activation link. 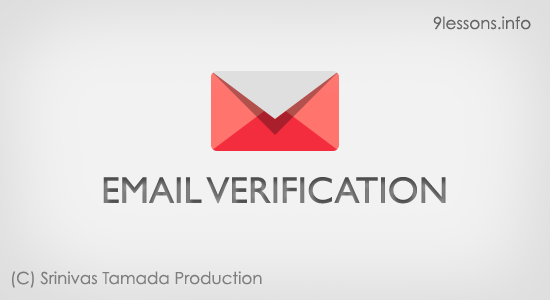 email verification/activation link not going to mail.how to send link. Note: Little problem with my SMTP server, emails are not working. I am working on this issue. i got Registration successful, please activate email. but mail did not receive..
any problem??? plz help me brother!!! hi,may i know how to fix these warnings.. I am not recieving any verification and your live demo is also not working. This will not work for me can you please create a code for woocommerce enquiry form in which user enter their email address and it will first verificate and the send email to admin for order. can u please tell me .htaccess file and do i need to type .htaccess code or is it builtin?? The requested URL /final_home/mailvarify/email_activation/activation/f271e02fcf28a159c9dead8a622fa358 was not found on this server. this error is coming please resolve. Demo has been fixed. Please try to replace mysql_ with mysqli_ and follow the article code. mysql_ methods has been depreciated. Please create a tutorial video explaining the same. Thank You.